Talking about the most recent tensions on the Korean Peninsula (See: “North Korea Is Mobilizing for War”), U.S. Defense Secretary Ashton Carter emphasized that South Korea and the United States need to be perpetually ready to deter North Korean aggression. 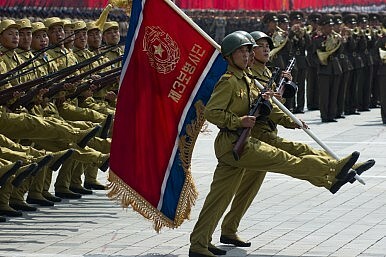 Inter-Korean tensions intensified after an incident on August in which two South Korean soldiers were severely injured by a landmine explosion, for which the North has been held responsible by the South. As a consequence of the August mine incident, South Korean propaganda broadcasts into the North resumed after an 11-year hiatus. North and South Korea also exchanged artillery fire across the demilitarized zone. South Korean President Park Geun-hye ordered the ROK military to immediately retaliate against any North Korean attacks. The North responded in kind and mobilized both land and naval forces (See: “North Korea Is Deploying Largest Submarine Fleet Since Korean War”). [I]n fact, there had never been an apology, much less a clear one. The Seoul government had simply spun a highly ambiguous, noncommittal statement signed off on by Pyongyang. In doing so, both sides were given a chance to save face. The North did not accept responsibility for the attack, nor did it use the common Korean verb for “sorry.” Rather, Pyongyang merely expressed “regret” over the incident. The United States maintains a forward-deployed force of approximately 28,500 servicemen and women on the Korean Peninsula.